Cthulhu is a cosmic entity who first appeared in the short story “The Call of Cthulhu”, published in the pulp magazine Weird Tales in 1928. The character was created by writer H. P. Lovecraft. Lovecraft transcribed the pronunciation of Cthulhu as “Kthûl’hu” (IPA: [ˈχɬʊl.ɬuː] ?). S. T. Joshi points out, however, that Lovecraft gave several differing pronunciations on different occasions. According to Lovecraft, this is merely the closest that the human vocal apparatus can come to reproducing the syllables of an alien language. Long after Lovecraft’s death, the pronunciation /kəˈθuːluː/ kə-thoo-lu became common, and the role-playing game Call of Cthulhu endorsed it. In “The Call of Cthulhu”, H. P. Lovecraft describes Cthulhu as “A monster of vaguely anthropoid outline, but with an octopus-like head whose face was a mass of feelers, a scaly, rubbery-looking body, prodigious claws on hind and fore feet, and long, narrow wings behind.” Cthulhu has been described as a mix between a giant human, an octopus, and a dragon, and is depicted as being hundreds of meters tall, with human-looking arms and legs and a pair of rudimentary wings on its back. 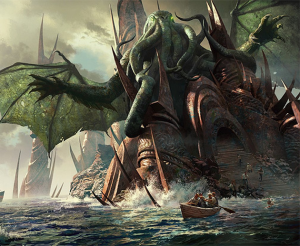 Cthulhu’s head is depicted as similar to the entirety of a giant octopus, with an unknown number of tentacles surrounding its supposed mouth. Cthulhu is described as being able to change the shape of its body at will, extending and retracting limbs and tentacles as it sees fit.